Air Tahiti Nui has brought its new flying experience to Europe starting today. 300 which for many years flew the connection between Papeete and Paris CDG via Los Angeles. About 300 guests, mostly from the European travel industry were invited on a preview flight from Paris. The traditional water cannon salute celebrated the first departure from Paris Charles De Gaulle Airport. Later the heading was north to Normandy, Bretagne until Brest then the down along the coast to Bordeaux and the mouth of the Gironde. Continuing to Montpellier, Marseille, Toulon, Hyeres and part of the French Riviera, Provence, then overflying the eastern Alps and then back to Paris. The new Poerava Business Class features 30 totally flat seats. The intermediate product is called Moana Premium Economy featuring Zodiac Z535s seats with a large high definition monitor, USB ports and courtesy reading lamps. The Boeing 787-9 Dreamliner has a noise reduction of 60% compared to other aircraft. The new Dreamliner has an avionics package that reduces turbulence by discovering areas in advance. It has an improved air purification system in the passenger cabin, flying at a lower pressurized altitude than the other aircraft. Passengers will seem to be more rested with graduated LED lighting, which conceptually was invented as a therapy against stress generated by long distance flights. On board there is a very high speed Wi-Fi connectivity. All screens are high definition image touch screens. Duty free can be booked on Tahiti-airstore.com directly from the place. 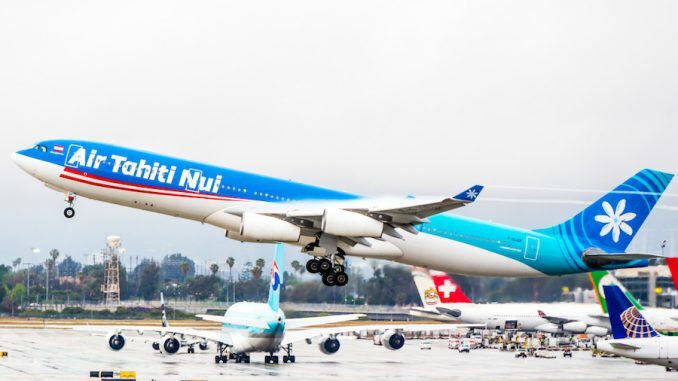 In 2017, Air Tahiti Nui carried almost half a million passengers, operating 1,631 commercial flights and nearly 18,000 flight hours, producing € 300 million in revenue and €17 million in profits. There are 800 employees.